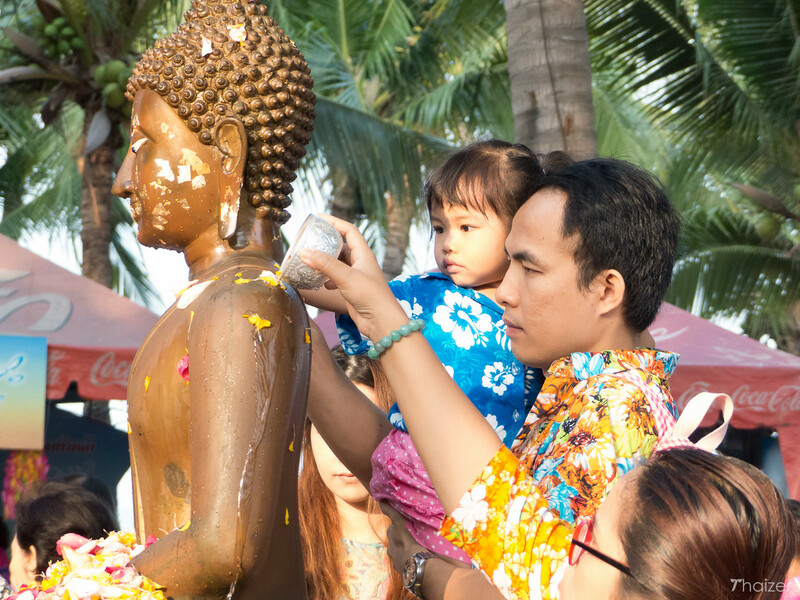 The Songkran New Year Water Festival in Thailand is celebrated nationwide. The official dates of the holiday are from April 13-15, but not every province celebrates in the same way or at the same time. 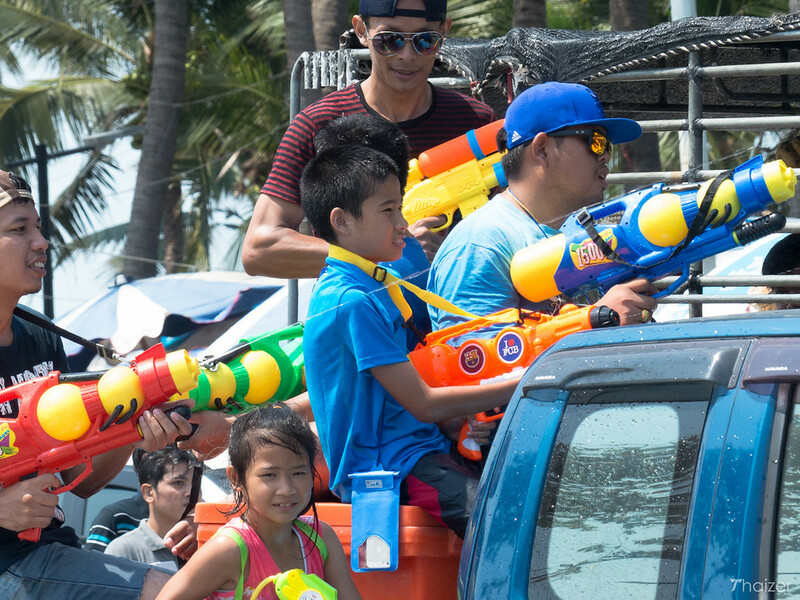 In parts of central and eastern Thailand, the most exuberant of the water throwing takes place days after the rest of the country have already packed up their buckets and laid down their water pistols for another year. 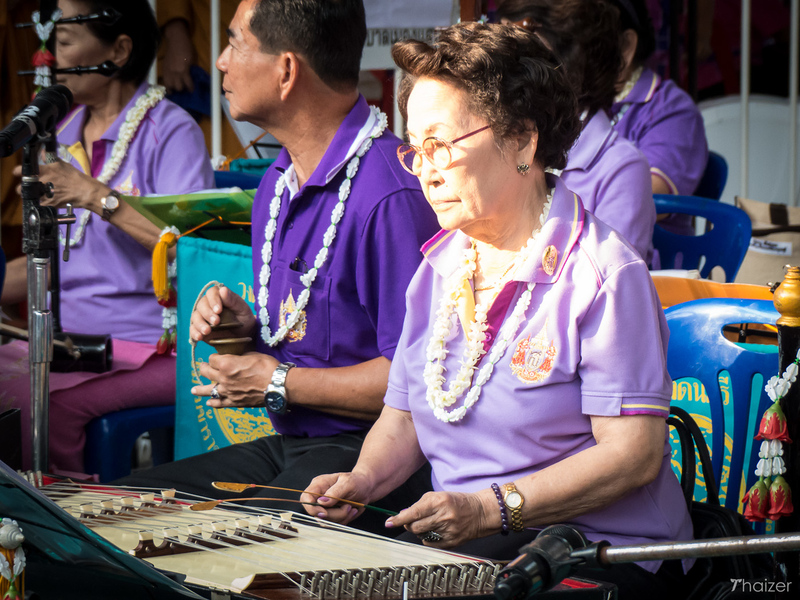 The Wan Lai Festival is celebrated in Chonburi province between April 16-20 with different towns and districts adopting different days for ‘Wan Lai’ (which translates as ‘the day that flows’). For example, the last of the water-throwing days in Pattaya takes place on April 19, whilst in nearby Bang Saen it’s April 17. 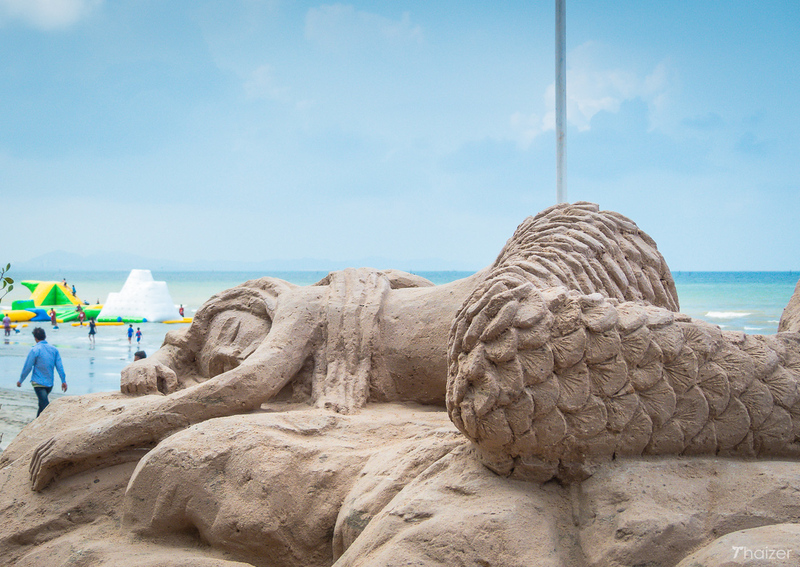 Held annually from April 16-17 as part of the Wan Lai Festival in Bang Saen, up to 100 intricate sand sculptures are created on the beach. Most of these are in the form of sand pagodas known as chedi sai, but there are other structures too. 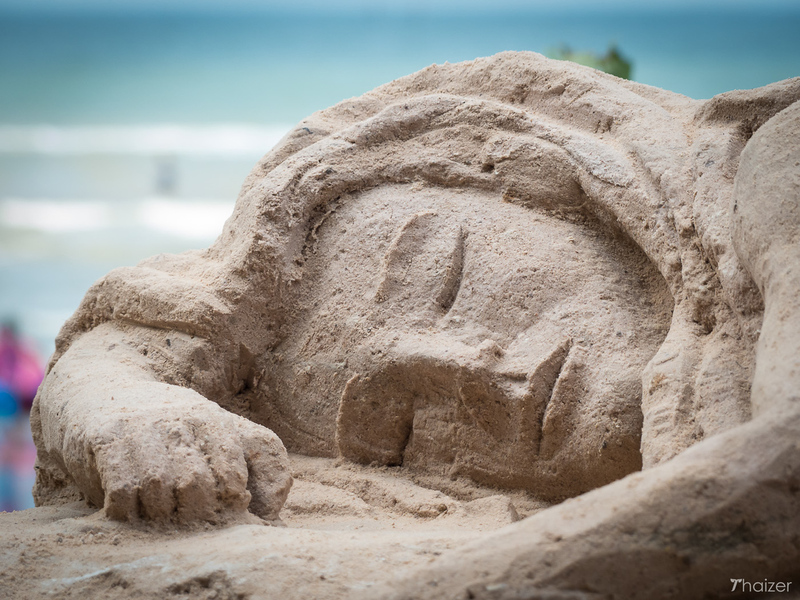 This year, visitors could see tuk-tuks, elephants and mermaids all made from sand. Plywood is used on some of the sculptures as support, but sand still has to be painstakingly moulded and fixed with specialist adhesive paste. 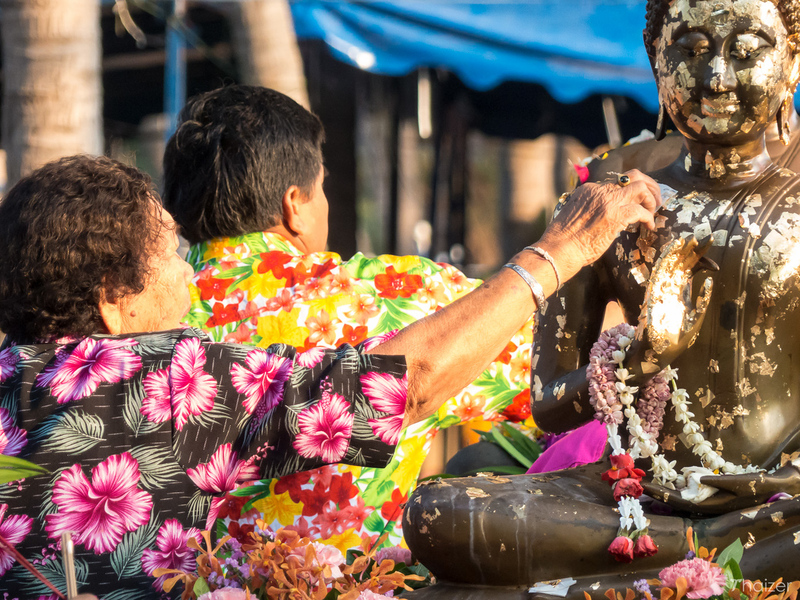 During Songkran, Thai Buddhists traditionally take sand to their local temple. The sand is then formed into chedis which are often decorated to make them more attractive. The symbolic act is to acknowledge the soil or sand that temple-goers may have unwittingly removed from the temple grounds with their feet during the previous year. 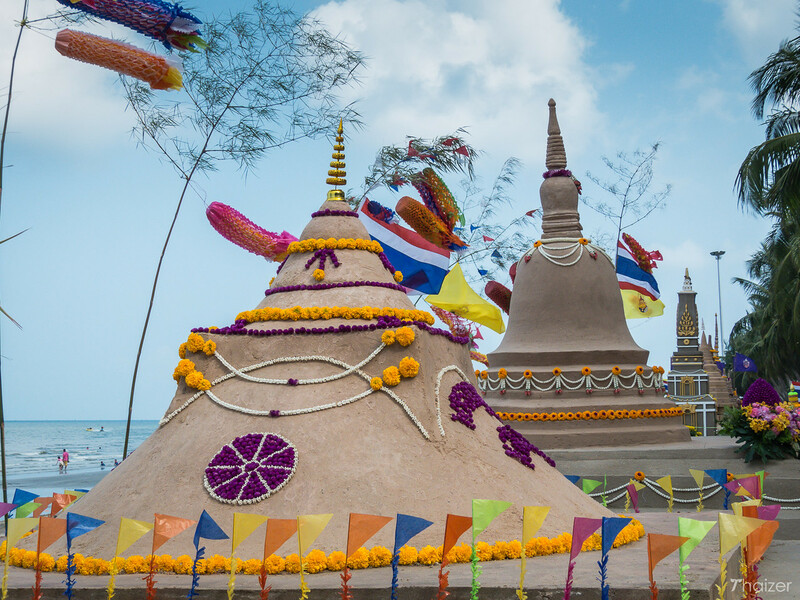 Returning the sand and forming chedis is a way of making merit at the start of the traditional Thai New Year. 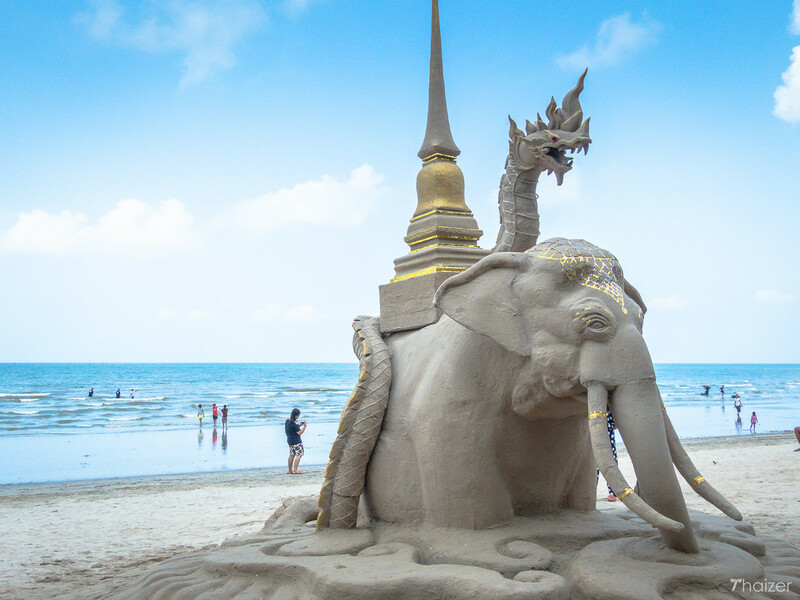 As a beach town, Bang Saen has evolved the unique tradition of building elaborate sand pagodas on the beach. 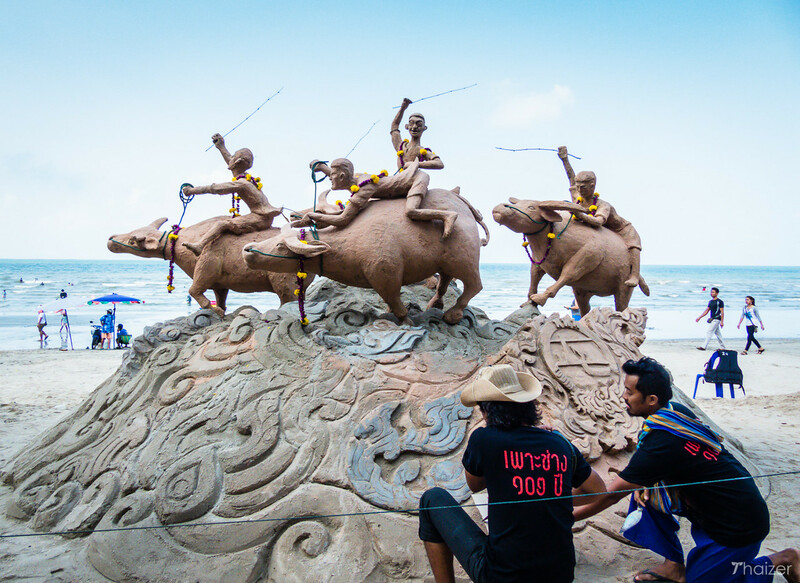 Teams of artists work on the sand sculptures for around 24-36 hours to have them ready for the competition that takes place as part of the Wan Lai Festival. Some teams set up lights so they can continue to work through the night with the finishing touches often still taking place just hours before judging commences. But the lifespan of the chedi sai is almost as fleeting as the mayfly. The competition is judged in the morning and that evening the sculptures are knocked down and the beach cleared. All that work and effort for such a brief time. But that is part of the teachings of Buddha. Nothing is permanent. 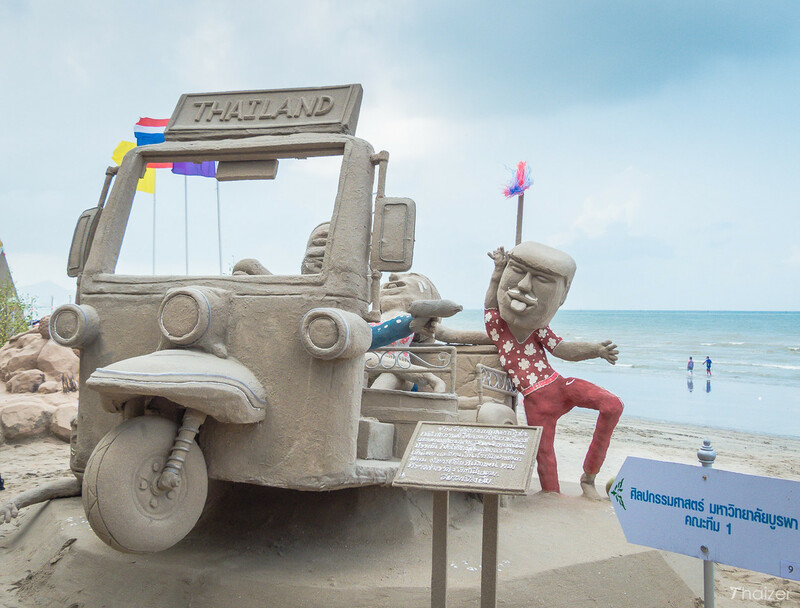 Although it’s the sand sculptures which are the main distinguishing feature of the Wan Lai Festival in Bang Saen, there is plenty going on during the day to make it a fun and friendly atmosphere for all the family. Local residents pour scented water over Buddha images and place gold leaf on the image as a way to make merit. Alms are also given to monks in a special morning ceremony on a stage area beside the beach. During the day, various activities take place to keep all age ranges amused. 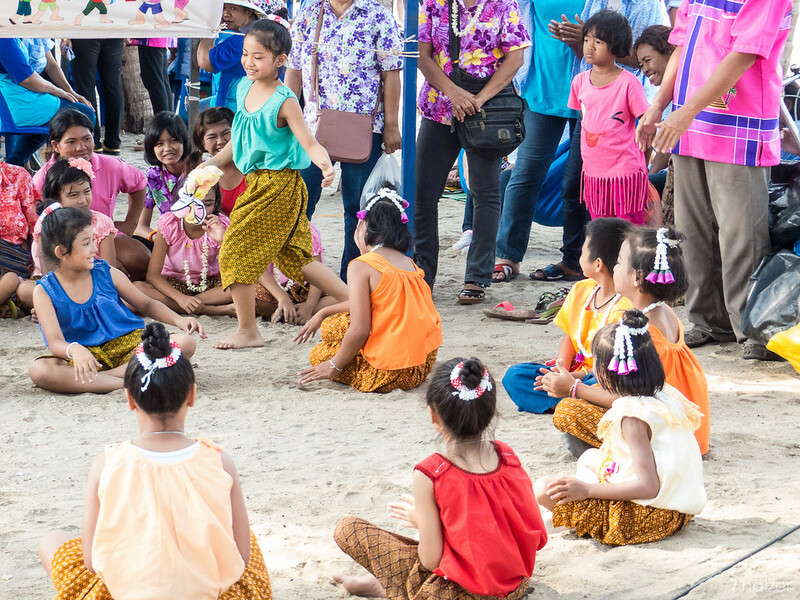 Thai music is performed in the morning and children play traditional games on the beach. 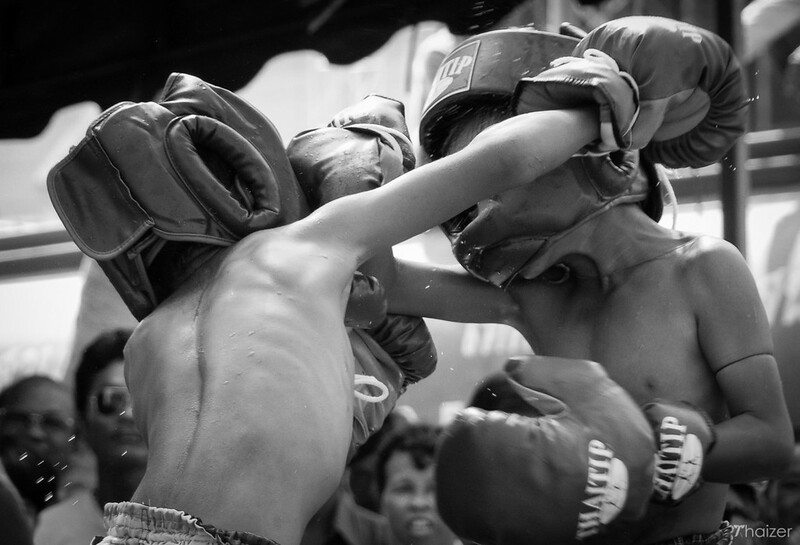 Men, women and children try their hand at ‘sea boxing’ known as Muay Talay. 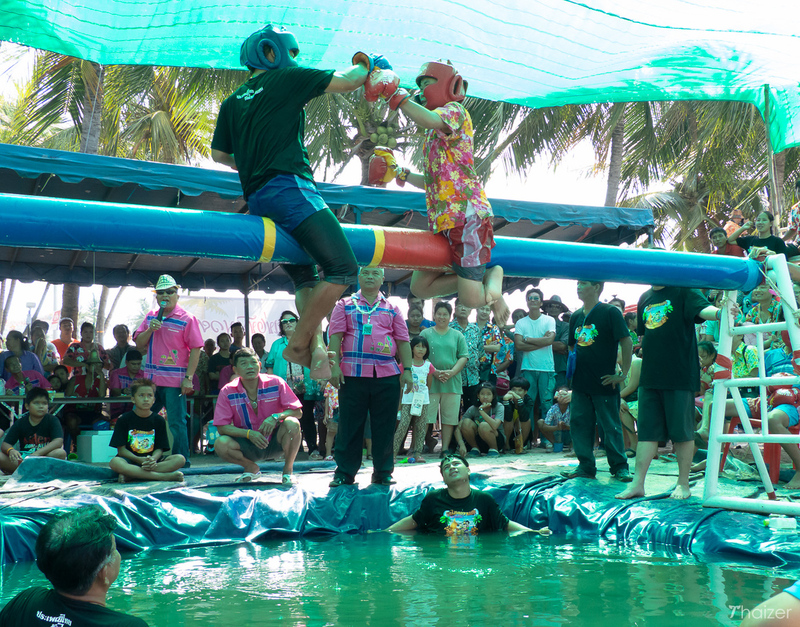 In a shaded arena set up on the beach, two combatants sit on a beam soaked with water and try to knock their opponent into the small pool below. With such a diverse range of activities going on in Bang Saen during the Wan Lai Festival, it makes for an enjoyable way to spend the day. People splash around in the sea with the sand sculptures forming the prettiest of backdrops to an otherwise ordinary beach. Families walk along the sandy pathways away from the water-throwing as the main beach road jams with pick-up trucks loaded with teens, twenty-somethings and the young-at-heart battling out the last of the Songkran water fights. Rock concerts keep the party crowd entertained during the evening, whilst those of us who can no longer party like they used to are able retreat to the sanctuary of the food stalls and restaurants adjacent to the beach. Bang Saen is very much a Thai seaside resort. Unlike nearby Pattaya, foreign tourists visiting here during Songkran and Wan Lai are still quite rare. 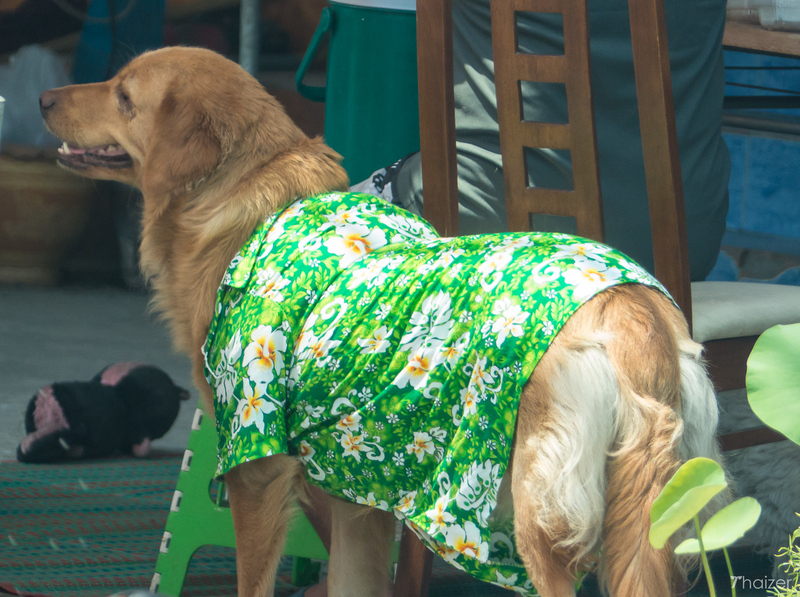 My experience in Bang Saen for Wan Lai was a positive one and it was enjoyable to see the cultural aspects of the festival beyond the usual water-fights and loud music. Amidst the mayhem of the water-throwing, the Thais I met were all very respectful and checked first to make sure I was happy to have water thrown over me and paste smeared on my cheeks. The atmosphere was light-hearted during the day when lots of families were out enjoying the various aspects of the Wan Lai Festival. But there was a noticeable change for the worse in the evening once the families had left for home and the effects of all-day drinking could be seen amongst many of the younger party-goers. And some of their pets too! 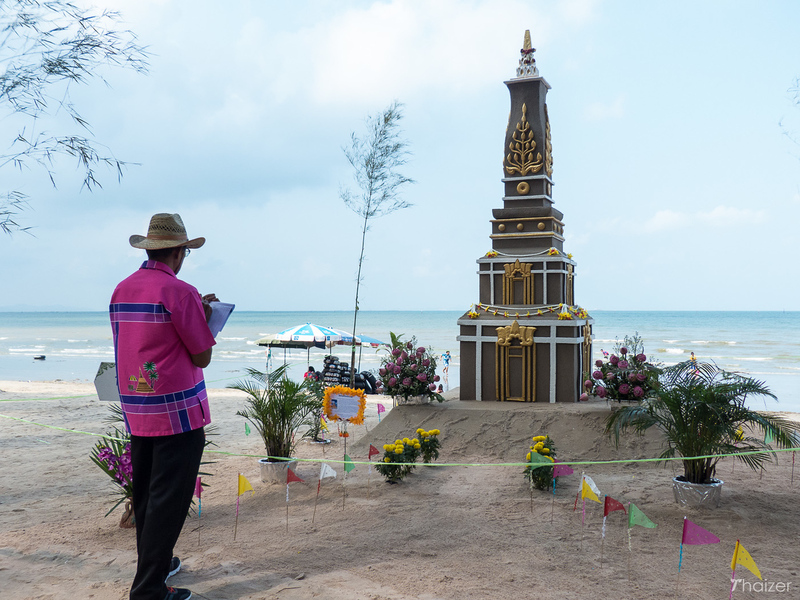 Wan Lai is held annually in Bang Saen from April 16-17. If you want to stay overnight, you’ll need to book your accommodation well in advance. If you visit as a day trip from either Bangkok or Pattaya, allow plenty of time for traffic jams. I heard reports this year of people driving from Bangkok and reaching Bang Saen in a little over an hour, but then taking 3 hours to travel the last few kilometres to their hotel because traffic was at a standstill. You have been warned!